I have shown two other examples for creating a connection between android and php. But still users are finding difficulty in grasping it. Here is one more post on this which is even more detailed. First create a fresh project named “AndroidPHP”. First we will create a layout for the login form. This xml will do this. copy this code to main.xml. Now create another xml named userpage.xml by right clicking the layout folder -> Android XML File. Copy this code into that. This is the layout to show in the activity when the user successfully logins. Now in the main java file im my case AndroidPHPConnectionDemo.java, copy this code. httppost= new HttpPost("http://10.0.2.2/my_folder_inside_htdocs/check.php"); // make sure the url is correct. This is simply a navigation page when the user log in. OK Android side is done. Now the server side (PHP). These things you need top remember. 1. Make sure the url you are providing to the android java code is correct. 2. Make sure your server is running. 3. Make sure your php page has no errors. 4. Also if connecting to a remote URL, you should have internet connection in your emulator or device. 5. Make sure you have a database named mydatabase(in this case) and a table named “tbl_user” and some users inserted in it. 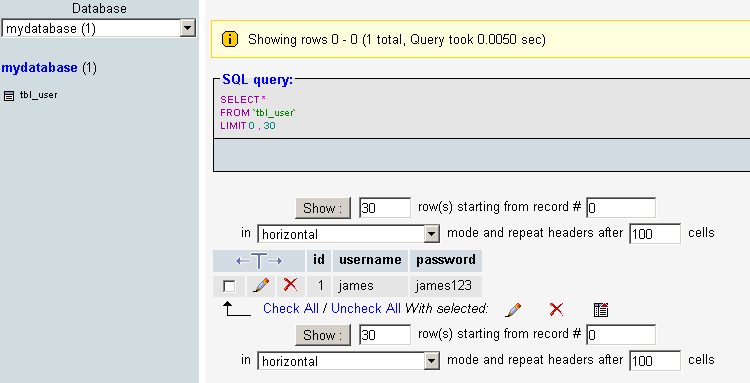 This is the creation query of the table tbl_user in the MYSQL database. I an using xampp server. So inside xampp/htdocs folder, i have a folder named “my_folder_inside_htdocs”. Inside this folder I have a php file “check.php” which has the code for checking the user in the database. Done.Now run your project and sign in with a valid user. that’s all. NOTE: All NETWORK OPERATIONS SHOULD BE DONE INSIDE A THREAD. Download the complete source code of this example from here. I’m new in android.This post is very usefull for me.I’ve run this,but it is showing a error like……. thus with login form of android in emulator…. what is the problem,I can’t understand…. So your php call is returning something, then what is your problem? Thank’s for your reply.But I’m not clear about is it working or not?I’m sending my demo site where i wanna login.If you can,you will check this please…Again thank’s for your reply…. But I can not login on other websites where I know the username and password ..
hello i am having little problem here , i have download your code run it on an emmulator but as i login it does nothin i think my url to php file is wrong or what i am using wamp. Hi Ayesha, are you getting any error or something. I dont know about how to place url in wamp. First try your url in the browser after putting an echo in the page and if it is working then place the url in android, that is what I am suggesting. I write the code without error and i get internet permission also. i enter userid and password also right but the program not display the result. what is my problem? I am new in android world. I have implemented your code successfully but problem is that even if I login successfully still it gives me an error like “User Not Found” and on text it shows “User Found”. This will not happen, because “user found” and “user not found” are inside if and else respectively. Please recheck your logic. And when i run the app, validating user pops up for a second then closes. Is this because my php is not working. If so how do i fix my php..
Dont browse the url directly it will not work, because I am using post to send the data. you could have browsed directly if I was using GET. This is a good example! Can you give me a hint with simple example of how to connect with SQL Server and fetch the data in android. In this example also you are fetching the data from a SQL Server. The data here is – whether the user is present or not. If you want some other data then edit the php file to return the data you want. Any data from the server will be a string which we can get it in the android side. trying to implement this code, but facing one error on “span” tag. Sorry, that’s the problem with my syntax highlighter. please remove those HTML span tags and proceed. hi, i’m facing a little problem here. everything works fine for me except when the user found, it will not direct me to UserPage. It just close the alertdialog and show back the login form. Please paste here the code how you are checking when the user is found. Apparently there needs to be an entry in the manifest file for the second page, i.e. Simply edit some code and run the project. This is not an error. This comes before you have already ran the same code and recompiling is not needed. everything works fine for me except when the user found, it will not direct me to UserPage. It just close the alertdialog and show back the login form. I am getting the following error when trying to run this code from eclipse on my phone via usb. I also tried using my pc’s ip and adding port 8080.
first please check whether your local server is running. Yes the server is running – I can access it via localhost on my browser. I forgot to mention I am running API 10. Would this cause any error? Thank you. Did you add the internet permission in the Manifest file. Also check the Logcat. I thought i’d share my solution in case some others made the same mistake as myself. I created a new activity in Eclipse. However, the XML code I copied from the beginning of the tutorial was placed in the MAIN xml (activity). Thus the two were not working together. The layout and class code weren’t communicating. So if the button doesn’t respond for you please advise. Why would it crash? I’ve tested a script on my server and everything checks out ok, but the app just crashes. Please check the LogCat for the error and Paste that error here. Hello B : Please check the LogCat for the error and Paste that error here. Hello B : Please check the Eclipse LogCat for the error and Paste that error here. Hello B : I have edited the code for All versions. Now it will not crash. PLease check it again. hi..i want to ask, when i create the database in xampp, i didnt find the folder inside the htdocs..what happen? is iam create manualy the folder or its generated automaticalyy when i create the database? and when i click the login button, the device didnt show anything..is it because not connected to database?where my problem?thanks..
You have to manullay create the folder inside htdocs and put your php files in it. There you have to write the php code to connect with the database. Did you add the internet permission in the AndroidManifest file. me too have the same problem and i add the user permission in my android manifest file…but there is no any change….. The post was posted in Android 2.1 so Please do the network operation inside a thread if you are working in Android > 2.1. Please paste the error that is coming in the LogCat. but how about if I want to use php session. Add the internet permission in the AndroidManifest file. First check whether your username and password are reaching the server, then check the response from the server. Try echo “yoursentusername” and echo “yoursentpassword” from the php server side after getting these values as POST. if you are getting the values together with response in the android side, then your values are reaching the server else check the android side. Check the result from your server. Check whether there is any exception is not. I am telling to check exceptions in android itself. print out the error message inside the try-catch and then you can know whether there is any problem with the server. hi , i trying to debug this application through USB to my phone . My computer IP is 192.168.1.4 …so , i charged to httppost= new HttpPost(“http://192.168.1.4/my_folder_inside_htdocs/check.php”); // make sure the url is correct. In the same time , i using in same network …Anyone know how to solve it and connect it ? For testing in your phone you need to install it in a public domain, the Localhost is for the system you are using not for the phone. I am trying to run this code from 2 hours and after validating dialog app show no response and these are logcat errors as under. these are erros and done uses-permission and also using Emulator having api level 10. Please help I have need of this example. After few try now it is always saying Login Error. When i am entering correct user name and password also it saying Login Error. The php response is showing User Found but android side showing login error. it is not redirecting to login success page. What can be the error? suggest. I have pasted all the codes as directed by you. But still my app is not giving result. When I give the username and password and click login after it, it only shows a pop up “validating user” and then nothing happens. hello.. first thing thx for this examples very useful but i have little problem i think there is something is missing to connect login button to php interface give mee “no such user” so i think maybee if wee add onclick in button login i think will work … what u think?? try printing out the count from the php file and check the result in the php side. First of all thanks for the great tutorial!! It works well but there is only a single problem. In Android activity – it shows the php respone that i have a valid user (n thats right) but the progress dailogbox shows me that i have a invalid user inspeat of having a valid user in database! I am stuck and i dont know why it is causing this probs!! It would great if i get respone as soon as possible!! Please check your php side script and check the response from php side in the Android side according to the parameters sent. I’m using a XAMPP 1.8.1. When I checking check.php file in the browser, everyting works fine I can get a name and password from the database, but in android app, nothing is going fine. Sorry for the confusion. In the below link is the solution to my problem. Use 10.0.2.2 instead of 127.0.0.1 if you are testing in the emulator and server is your system itself. Thanku you for your reply. If I would like to launch an application on an external device (not emulator), then how address looks like? i have interested in learning for creating the mobile apps in android so please guide me so that i can became a android developer i can understand the program but some terms i cant understand. Hi james.I really appreciate that from your busy schedule activities, you are giving us time to solve our issue.I am new to android development and as suggested by your article, if you will send me code to fill spinner with mysql table records using php and mysql.I have a project in which i have to implement this.Your current reply will help me a lot.Thanks in advance. Thanks for your quick reply,but I have already tried to fill spinner with sqlite database and i have succeeded in that.Actually I want fill spinner from mysql database.I will really be very greatful to you if you send me code realted to ‘Fill spinner with mysql’. Hello Sir…my code runs just fine when the correct username password combo are entered in the android app…but on entering incorrect values, the application force closes..i have tried in vain to solve this error..even replaced the alert dialog with a simple toast message..but still fails to work.can you help me out? Thanks in advance. Try to run it inside a thread because from 2.3 onwards network operations need to be run inside a thread. Check the important things to note that I have posted in this article. Make sure you have done those correct. Where to put the database files? I have sql query browser on my computer. Can i use this for creating the database? My code is not running properly. As i click on signin, validating user comes for few secs and then nothing happens. print you username and password in the LogCat and also print the reponse from server in the Logcat and check it. solved it! Adjusted some permissions in the apache files, and it worked fine. Potboiler what did you adjust to allow permissions in the apache files. I’m getting the same problem you had as well? code is working properly but it is not validating my userid and pass..
Had no problem in running just one that in one of your screenshot you showed a page with only text [login success] i hope that after login that page should not open. And also tell me that after logging in how can i redirect to another page? check the response and start another activity. Connection error is my problem? Check your file exists in the server and you have internet connection. Also you should have INTERNET PERMISSION in the Manifest. Hi,,nice tutorial..i can run this tutorial..but after i click log in, the toast said user found..but it dont go to the userpage..i already add internet permission in the manifest..hope someone can help me..thank u..
Hi james… I am getting many errors in eclipse with this code.. please help.. I copied the entire code and compiled it without errors but when i ran it there are several null pointer exceptions and also fatal errors and zygote errors. could you tell me how to solve them? May be it is due to my syntax highlighter problem. Check for spelling mistakes and case mistakes. Hi James, i encountered some problem with the login page. when i type either the correct or incorrect username and password it does not bring me to the respective pages. when i clicked login, it just stays at validating user, thats all. Can you please tell me how I could fix this? Thanks in advance! Make sure you put the ‘$’ sign before variables in the PHP. i copied the javacode to my eclipse i got two error they are..
can u help me to solve this?? Exception : android.view.ViewRoot$CalledFromWrongThreadException: Only the original thread that created a view hierarchy can touch its views. For those complaining about two problems: 1). cannot connect to your database and 2). cannot show the new activity page after login successful. Please read on for the solutions. and finally James thx for the tutorial !!!! excellent ! Thanks for much James and faisal..
Really it’s helpful to me.I wasted my 2 days time to connect Mysql DB from android using JSON+ php. This is very simple way to achieve this.Your post is simply Super. thanks for your good work.keep it Up. My login is working, PHP is return true to me. But after, when I call another method, I do a session verification for know if the user is logged. How can I get and set this session through the android app? Save it in a global variable or preferences. Though i know it’s not possible but thought i am getting the problem of one same person that is at the same time text view of id tv shows me ‘user found’ and dialogue box shows me ‘user not found’. If you wish i can mail u my code. My project run properly in localhost i mean in xamp but not works with my webserver url.. i check several times of my url but didnt get any sol8n. itz not take input from username and password i mean submitt button didnt work.. can u give me some proper idea..
and my subfolder also named my_folder_inside_htdocs. Did you give the internet permission in the android manifest file. please check your logic in the server side. im having some difficulties, when i log in nothing happens. please help. httppost= new HttpPost(“http://10.0.2.2/Aconnect/check.php”); // make sure the url is correct. // edited by James from coderzheaven.. from here…. this is my code. its looks exactly the same but there are some modifications. and this is my php codes. i have added internet permission to my manifest file but still i get errors in my log cat. 1) once i press the login button in the emulator there is no navigation to login success page and there is no change as the login form remains the same. I only get validating user and no change happens. 3) what should be the android manifest file? 4) i have done certain modifications in the code and i shall mail you the code. Please suggest some solution as soon as possible, as i am doing my project on android and having a bad deadline to submit it. Please do the network operations in a new thread instead of main thread from android 2.3 onwards, otherwise it will not work. Thanks for the tutorial, I had not found a good tutorial like yours. I had no problems, everything works. Greetings. Can I ask you why didn’t you use Jsonparser .I didn’t even know that it’s possible to connect without it. you can use json parser also, this is just another example. “user not found” although i entered the right values. response from php : no database selected. Please check your database name and logic you have changed. Can you please explain what exactly was placed in the brackets? Its the server address where your server side code is located. 10.0.2.2 means it is localhost or your system is your server. httppost= new HttpPost(“http://10.0.2.2/my_folder_inside_htdocs/check.php”); // make sure the url is correct. The error might have came when you copied the code from my site. please check each line. I downloaded the code. there is no errors in the code but if i click on login button its not getting or starting the UserPage.java. Can anyone pls do help me out in this what i have to do. You may have to change the code according to the instruction in the tutorial. Whenever I try to login its showed ‘login error’ and show the line of php which written on php file. mysql_connect() may be deprecated…so there will be another method similar to it. Use that. This should not cause any problem. Thanks for your good examples and tutorials! I corrected URL in AndroidPHPConnectionDemo.java and PHP file. Login button does not work. remaining only login front page. Could you please check the Logcat and see what is happening when you click Login Button. how i can apply this ? how i can achieve this ? Did you managed to connect to PHP and authenticate? If yes, then pass the “role” as parameter along with the intent for navigation to the next page and get it there and do accordingly. I import the project into eclipse. and trying to run on emulator but after entering the data into text field . when i click on login button . only validating user is come .. and then after some time nothing will happen on screen. http://localhost/my_folder_inside_htdocs/check.php but still not working. .. Send your code to coderzheaven@gmail.com. I will try to fix it. where to create the check.php file? directly create a notepad file with .php extension. By doing what u have told , after entering username, password while i click login its says validating user and stays in the login page itself. there is no response. since we are calling a script in the server, check.php should be in the server. hi james..i am copy ur code and some place i currect the my relavent code..but that time i am insert currect username or wrong username password that time same error is shown user not found…so why waht is the problem..
Hi, I want to make session control with php and android .Could you help me about this subject? Sir, the code opens debug perspective on button click and the logcat error shows—> skipped 103 frames..the application may be doing too much work on the main thread….pls help me sir as my complete BE project depends on it. 10.0.2.2 is the localhost for Android. If you are using your developments system;s localhost as Host, then you should use this. This tutorial is very helpful but there is a problem in my php file. It is giving my error that variable in which i am taking input from the user is undefined index. I m taking phoneNumber as a input. The id of the TextField in xml file is textView1 and the MainActivity I defined a String of “PhoneNumber”. You need to register the activity in AndroidManifest.xml to make it go to UserPage after login. AndroidPHP does not specify a android.test.InstrumentationTestRunner instrumentation. On Click login button , it is just showing validating user, rest all is not coming up. Hi James, i have this error.